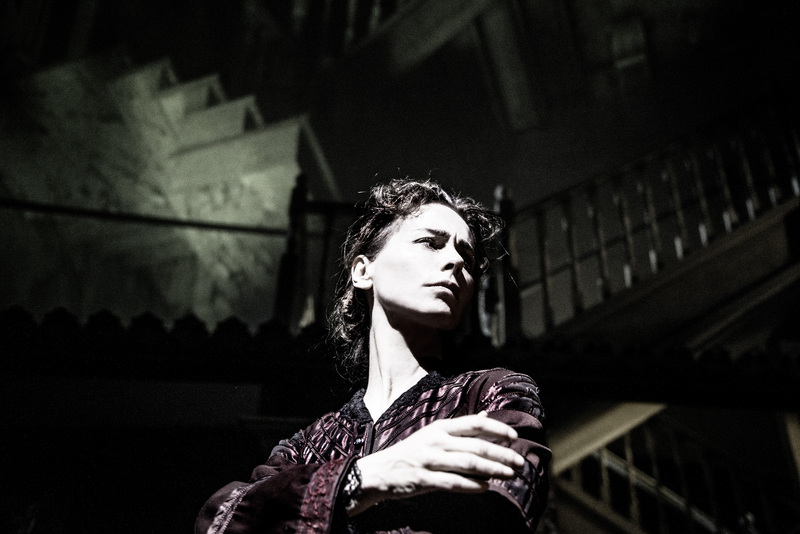 Review of Gaslight, starring Tara Fitzgerald, Royal & Derngate, Northampton, October 2015. 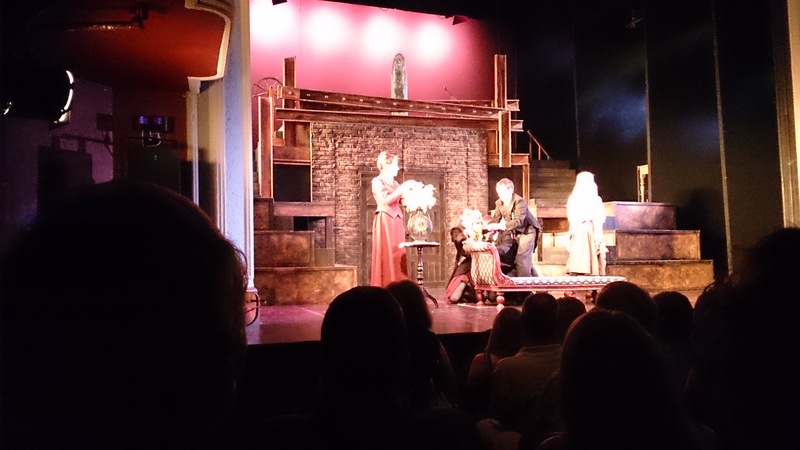 YOU usually find mention of the set design for a new theatre production much further down in a review, but in Gaslight at Northampton’s Royal Theatre the stage is the first star you lay eyes on. With the action confined to the classic ‘one-room-in-a-period-setting’, it’s a tough job to be original. But William Dudley and the Royal’s set-production team have created a stunningly clever Ames Room – one of those that alters your perception of the things within it – which perfectly reflects the theme of the play: manipulation of someone’s mind to make them doubt their own sanity, or Gaslighting. The use of clever modern video projection, in a 130-year-old theatre, for a play set in stifling the stifling late Victorian age shouldn’t work – yet it does, brilliantly (except for one very ridiculous section near the end which doesn’t, and made us laugh when we should be shocked). We had no time to leaf through the programme beforehand, which is just as well, because then we had no spoilers or expectations. This is a psychological thriller, which made the entire audience shift uncomfortably in its seats as the stellar cast messed with our minds. 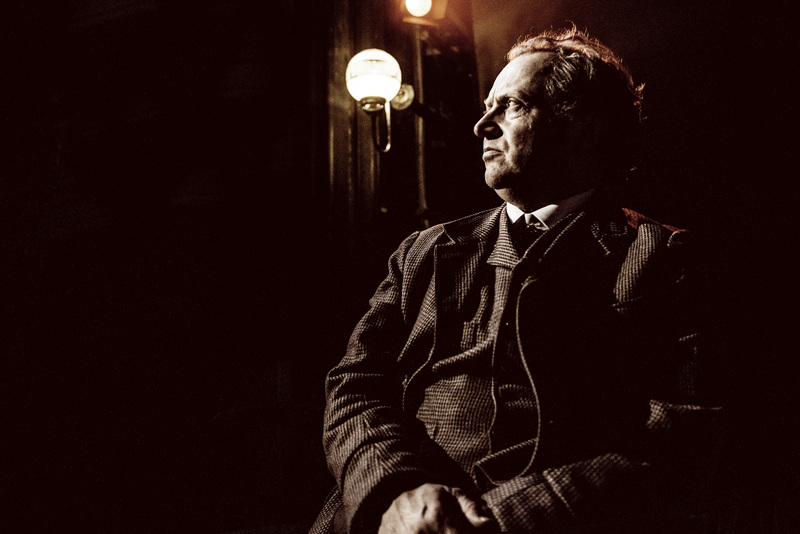 Jonathan Firth as Jack Manningham in Gaslight. 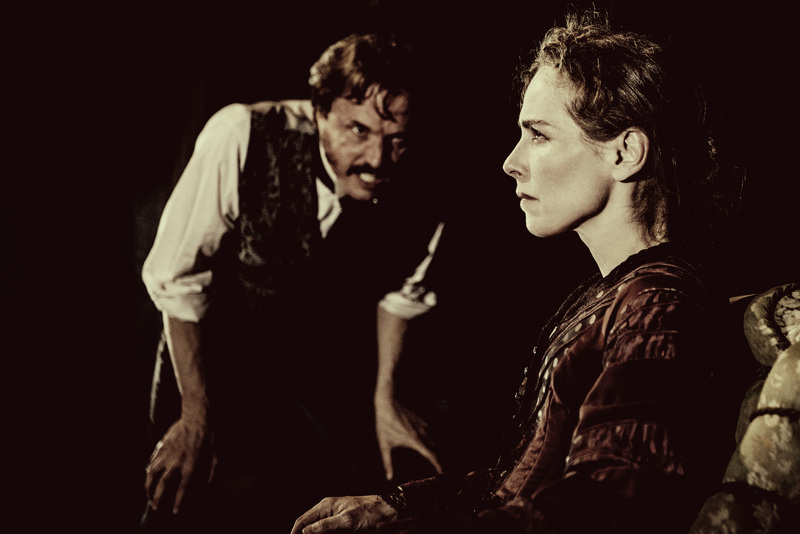 Tara Fitzgerald is exquisite as the vulnerable, bullied Bella Manningham, running the gauntlet in her own house between her domineering husband Jack, played menacingly by Jonathan Firth (I was two-thirds through before I recognized him as Colin’s brother), the servants, and her own sanity. Fitzgerald stars in the globally popular Game of Thrones and I suspect a percentage of the packed audience was there to see her. Is her encounter with her apparent saviour, the rosy-cheeked Inspector Rough (Paul Hunter), just another example of her mind playing tricks? No spoilers: You’ll have to go and see for yourselves. 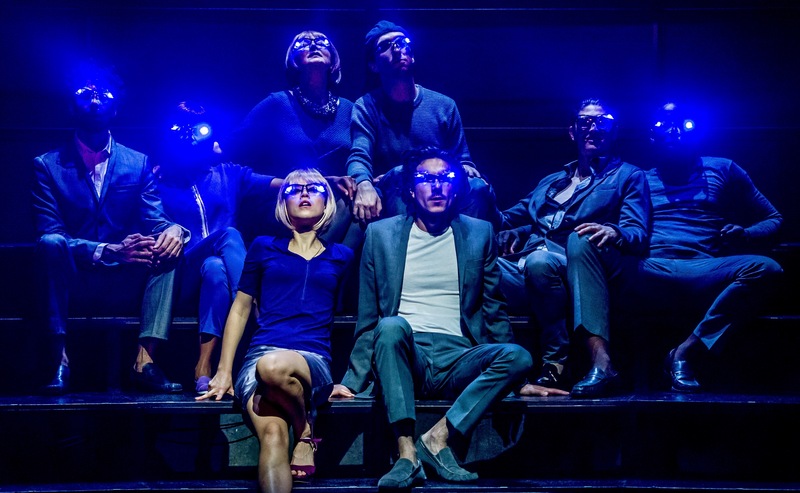 Review of Brave New World, world premiere, at Royal and Derngate, Northampton, running until Saturday September 25, before touring nationally. Press night performance. Olivia Morgan as Lenina and William Postlethwaite as John the Savage, with ensemble. 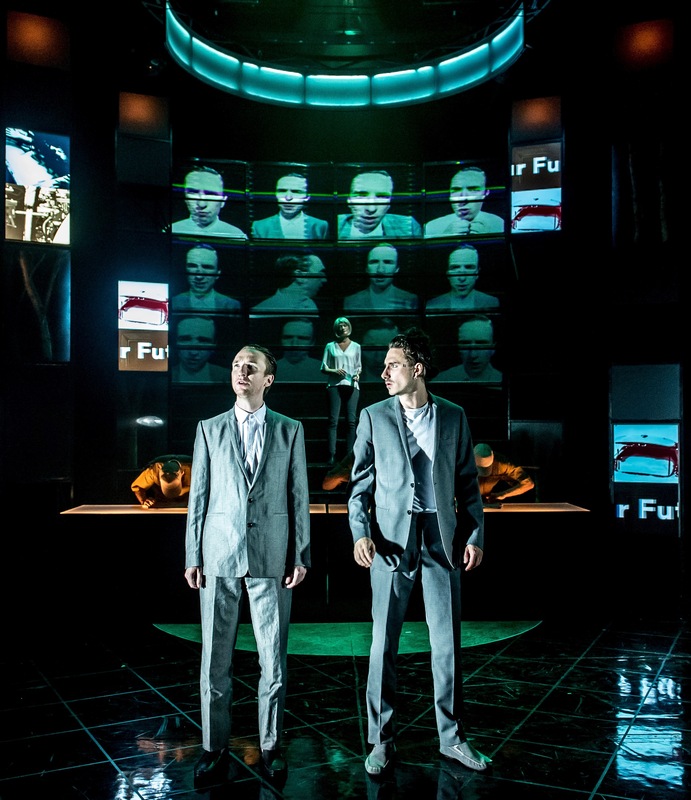 IT is a compelling, and at times uncomfortable, adaptation of Aldous Huxley’s dystopian Brave New World which challenges the audience at Northampton’s Royal theatre. Those not familiar with the original 1931 text will not struggle to find familiarity in its themes, particularly pertinent to contemporary issues of the stupefying capitalism of western society juxtaposed with the violence, poverty and despair of the abandoned poor. And hey, you get the story that spawned the Hunger Games trilogy, and even a Poldark-esque shirt-off scene from the floppy-haired William Postlethwaite as the passionate outsider, John the Savage. 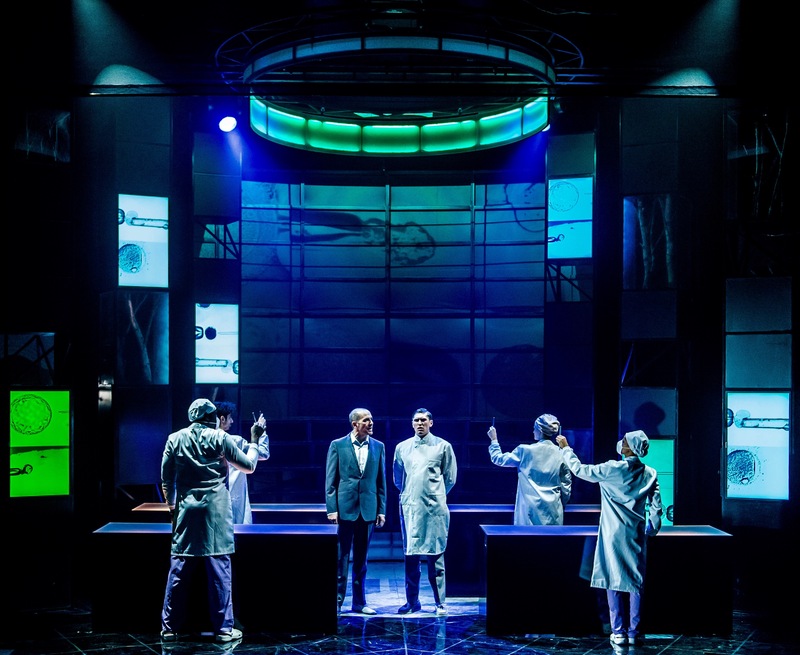 The production whacks the viewer straight between the eyes – opening with a boom of music and lights and steading with the sterility of the laboratory conditions of the hatchery and conditioning centre. For this is a world 500 years in the future where parentless babies are grown in test tubes and genetically modified to join their caste of clones to work in factories and sewers, or to be the educated Alphas and Betas of the elite. Happiness is essential, and those misfits who aren’t happy and promiscuous are shipped off with their unwanted emotions to remote islands. Meanwhile, out of sight and left to rot are the majority of the population, the Savages, who live ‘naturally’ while imprisoned in vast ‘reservations, occasionally gawped at like zoo animals by the holidaying Alphas. These two cultures come into contact with the discovery of a young man accidentally born naturally in a reservation, and brought back to see the utopian world of his elite parents. John the Savage, educated in secret by reading the complete works of Shakespeare, sees the world through the constraints of ancient, Tudor rules, and is both enticed and repulsed by the hedonism of the World State. On press night the theatre was packed, and any early-run technical issues had clearly been fixed, as the multimedia production was visually stunning. Huge video screens hung above and around the stage adding texture and depth while the original music by These New Puritans was perfect for the adaptation. 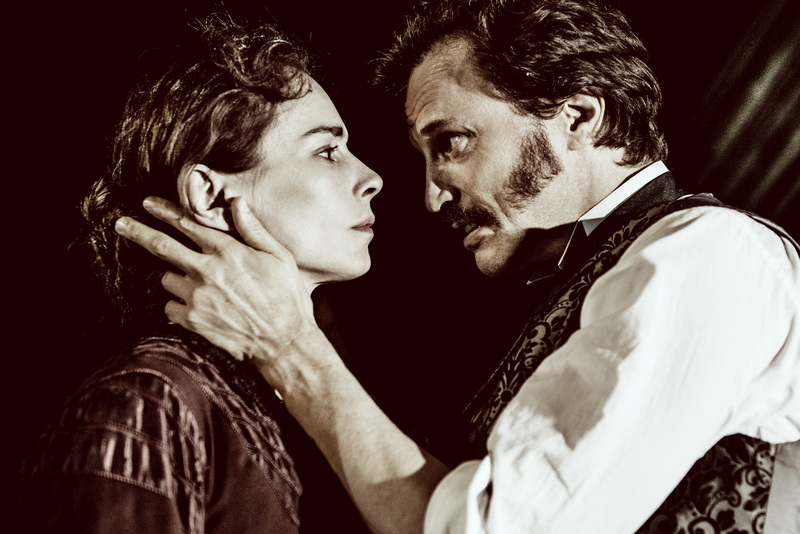 The casting is excellent, particularly for the performances by Gruffudd Glyn as the bullied misfit Bernard Marx, Samantha Pearl’s naturalistic portrayal of conformist Polly, Olivia Morgan’s confident Lenina and Postlethwaite’s conflicted savage. All ones-to-watch. Also in the talented cast of ten is Abigail McKern as Linda, the bedraggled former Beta elite and John’s reluctant mother, who gives both mature gravitas and light relief to the piece, while playwright Dawn King’s adaptation cleverly morphs the dictatorial World Controller Mustapha Mond into the female Margaret Mond, played with cold indifference by Sophie Ward. There were issues – particularly with the pacing and delivery in the first half when the necessary set-up of the story meant the audience was starting to lull into a Soma-like stupor. It just needed to be faster, more dynamic and daring, to match the visual staging. There were a few fluffed lines in the second half, but nothing too distracting and I’m sure this is a production that will gain momentum and develop as the run continues. It is a definite go see; an excellent story and a timely reflection, albeit written in the past about the distant future, on our own present. It’s no wonder Spielberg is planning a film version. 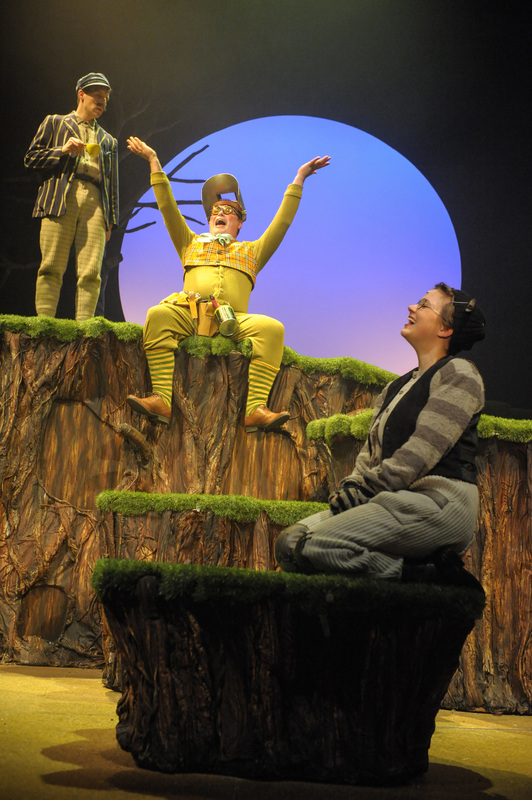 Royal & Derngate has two Christmas shows on offer each year, the traditional sparkly, generic panto in Derngate (Sleeping Beauty) and in the Royal, the Wind in the Willows, a lovingly hand-made, in-house production based on the book by Kenneth Grahame. Before the show even started there was added drama – the original Mr Toad, Jack Edwards, had fallen down some stairs and literally broken a limb before the opening night. Substitute Mr Toad, Gavin Spokes, had just two days to rehearse the leading amphibian role, including all lines, songs, moves, dances and props in a very physical show. But he did so (sorry Jack), with aplomb. It might seem odd to start by commending the set and staging, but the work done by designer Sara Perks and her team really steals the show. 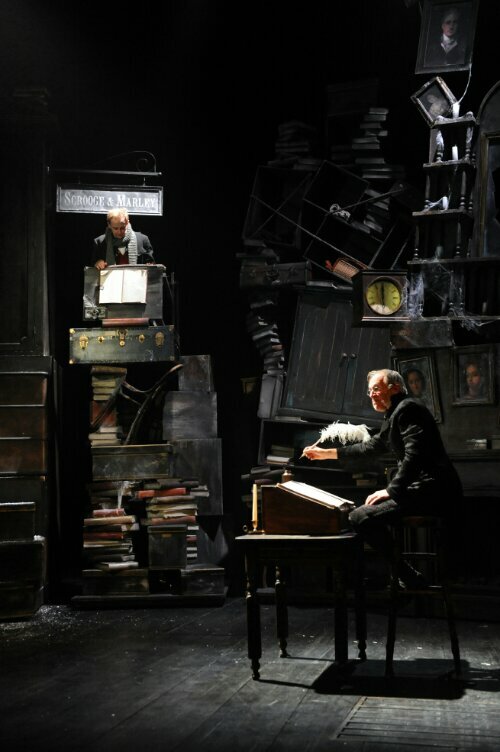 The Royal has a small stage but the stage design with rotating turntable had grassy hillocks rolling past the riverbanks, layers and layers of Toad Hall, the Wild Wood, the Prison and Courtroom, all moving incredibly quickly and dynamically, with the cast jumping, rolling, diving and climbing over staging and props throughout. It was exhausting just watching them. And then there were the bubbles, and the real snow falling on the audience too, and the clever costumes . . . all crafted by the Royal’s talented team. 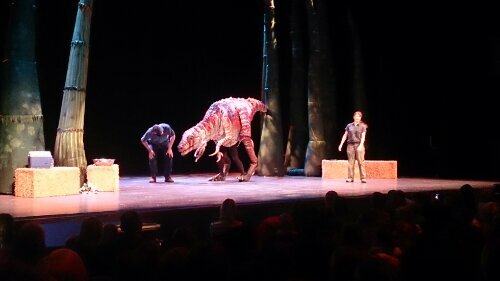 The ensemble acting as caravans, cars and horses with impeccable comedic timing only added to the action. Ratty (Christopher Harper) and Mole (Katy Phipps) are an endearing pair from the off, trying to keep the rambunctious and spoiled Toad from harming himself and those around him as he races from one fad to another. His downfall comes in the shape of a motorcar, cleverly ‘played’ using members of the ensemble making funny noises. Outstanding performances from all the leads, and the children’s cast (parents, acting as a daily taxi service, I feel your pain) plus a showstealer from Jennie Dale as the Judge – what a voice! 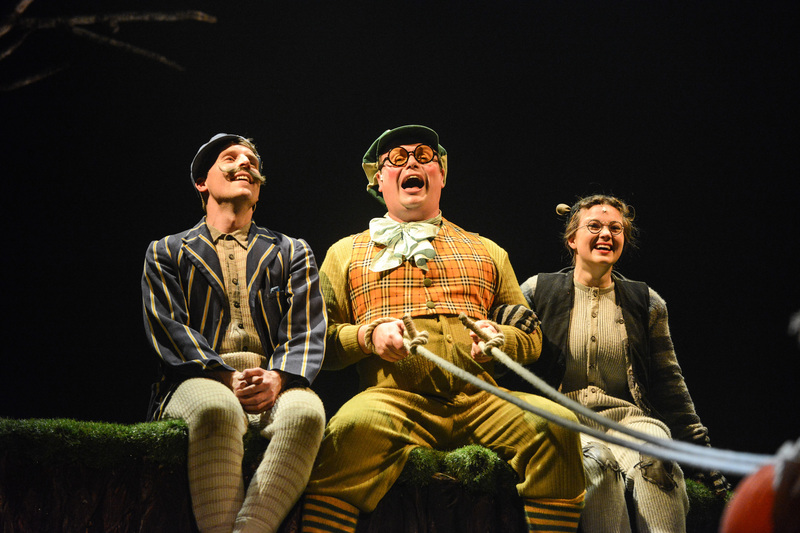 Wind in the Willows, thanks to Gary Sefton’s direction, is a must-see, bringing a fusty children’s classic to life for a new generation. Tickets are available for shows until the run ends on January 5. A direct hit for Wind in The Willows. Next year’s show has already been announced: it’s Merlin! 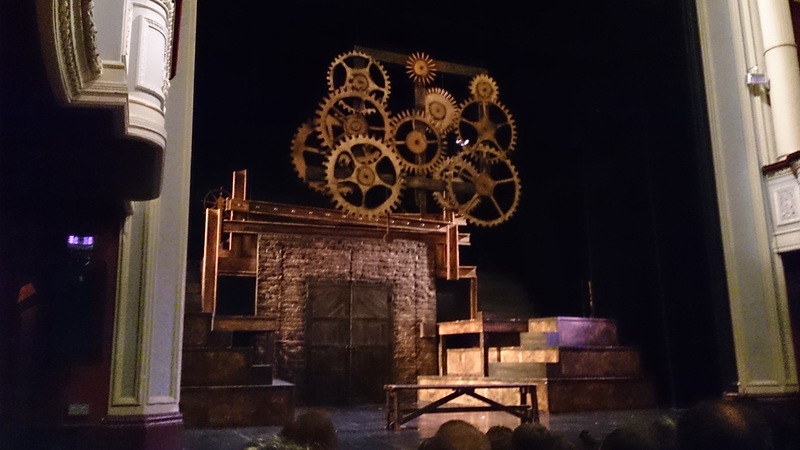 IT might have been the hottest day of the year outside, but the audience at Northampton’s Royal Theatre were enjoying something very cool on stage in the form of His Dark Materials – based on the brilliant trilogy of books by Phillip Pullman. This was not a conventional night for theatre-goers. The evening performance on Saturday was Part 2, and surely everyone there had been to Part 1 either earlier in the day. (Or earlier in the week). So if you’d booked the Saturday it was a marathon session of viewing starting at 2.30, breaking at 5-ish and back for Part 2 at 7.30. If you hadn’t read the books or at least seen the DVD of the Golden Compass, the shows could have been baffling to follow too, as the books have detailed plots. 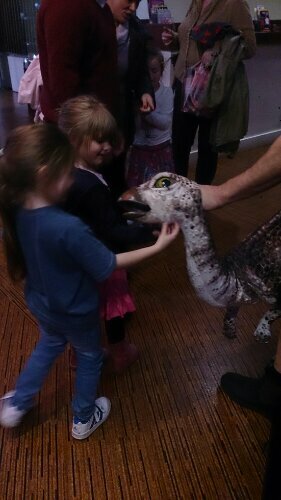 The show, with amazing puppets and puppeteers, an incredible set and 50 performers, was also entirely cast with under 21-year-olds – the companies of Royal & Derngate’s contemporary and classic theatre schools. You’d hardly have known. The performances, especially of lead Demi Rixon as Lyra, tirelessly tearing around the stage as her character does in the books. Other notables were Ryan Leder’s armoured bear Iorek Byrinson and the witch Serafina Pekkala (Emma Cranston). Credible performances too from Will (Chris Normington), Mrs Coulter (Erica Tomlin), Lord Asriel (Luke Nunn) and the scene stealing Angels. There were fights, huge scenes with Les Miserables-sized casts on stage at once, and it flowed beautifully. The daemons, played throughout by cast members visibly moving and voicing these exquisite puppets, were a touch of genius. You have to hand it to the teens who were working the puppets, often on hands and knees or stooping for long periods – certainly youngsters were going to do this far better than adults with rickety joints. There were the expected issues with such a huge cast of nervous new teen performers, rather too much mumbling throughout from some characters meant dialogue was hard to hear in places (voice training and projection possibly tricky with so many performers). But the strength of direction (Natalie Diddams and Chris Gorry certainly deserved the standing ovation as much as the actors) and the tech and staging professionals helped this be so much more than an amateur production. 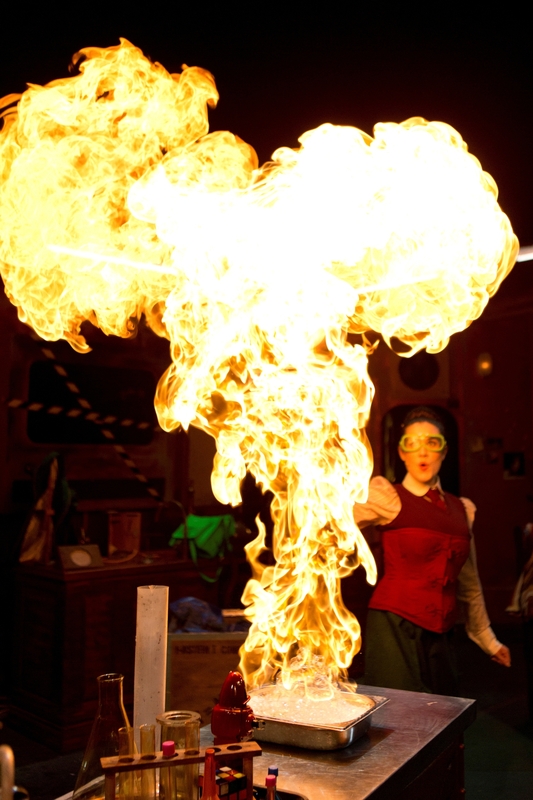 A gamble by Royal & Derngate to stage such a huge production? It was truly brave and ambitious, and they totally pulled it off. This was before the curtain had even gone up. Admittedly, it was a scary black curtain, which rose to show a classic Victorian street scene – only with the added brilliance of the Royal set-makers; boxes piled on boxes, upon bookcases and grandfather clocks. All moveable mini sets which characters could climb and peer through. 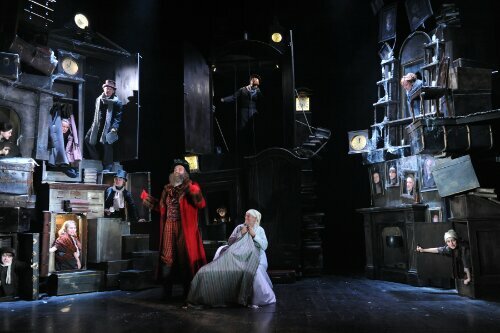 A Christmas Carol has been going down a storm at Northampton’s Royal & Derngate this year, and rightly so. I haven’t heard a bad word about 2012’s in-house offering – a welcome antidote to the giant celebrity-studded Bobby Davro/Denise Loose-women omnipanto next door in Derngate. Pantomime it ain’t. The show sticks to the original Dickens classic story pretty religiously and that’s to its credit; there’s no soft-soaping of the Victorian urban setting here. Poverty, cold and Scrooge (played to miserly perfection by the considerably younger Sam Graham), grumbles and snarls his way around Christmas Eve like there’s no tomorrow, and of course, for him there might not be. 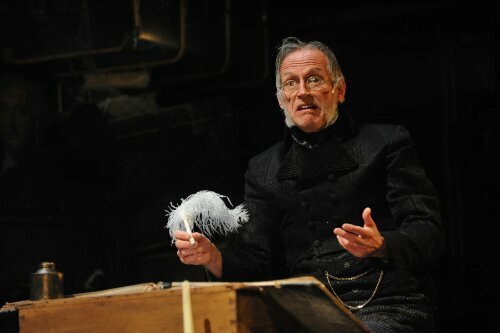 Cue the three ghosts – the Santa-like Andy Williams gives a show-stealing turn as the ghost of Christmas present as well as Jacob Marley – and Scrooge has to clean up his act for the sake of poor old’ Tiny Tim and the Cratchetts. 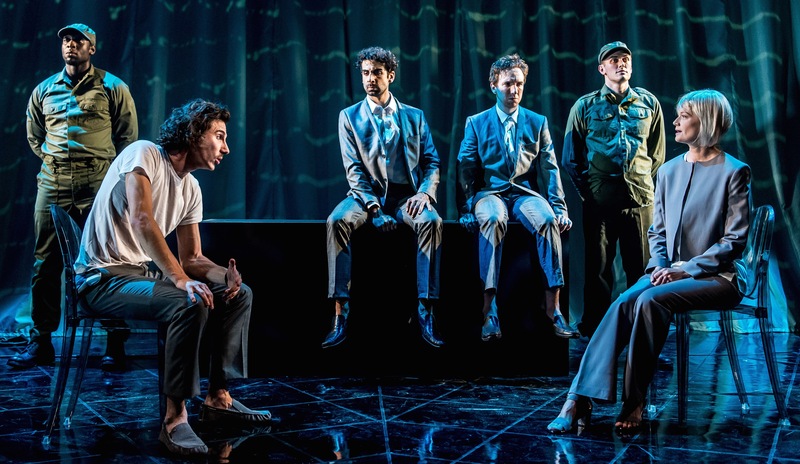 The cast are marvellous, and combined with a slick script and that mesmerising set, it’s a set of ingredients which leaves the audience feeling full and contented. Even the four-year-olds. If you manage to get a ticket, do try to see it before the run ends on January 6. Box office is on 01604 624811. I can’t guarantee any celebrity spotting on the way out though. Our Bloke saw Philip Schofield as we were leaving, although none of us – bah humbug – believed him. Turns out he was watching his brother-in-law play Scrooge. DON’T be misled by the title of Sandi Toksvig’s mesmerising post-war drama Bully Boy, currently running at Royal & Derngate in Northampton – I’d wrongly imagined some sort of public school stuff costume piece or a gritty exploration of modern urban state schools. 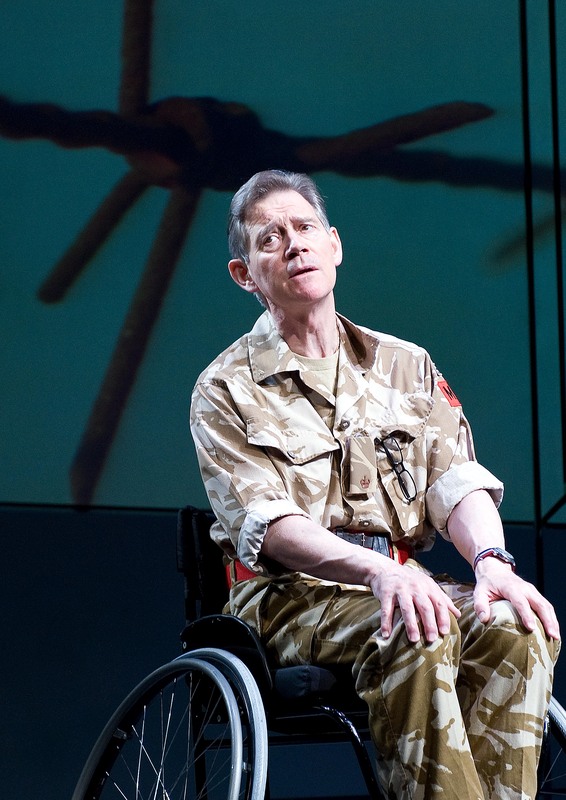 No, the education here is of the audience, taught through the story of two traumatised soldiers brought together during the investigation of a grim war crime. 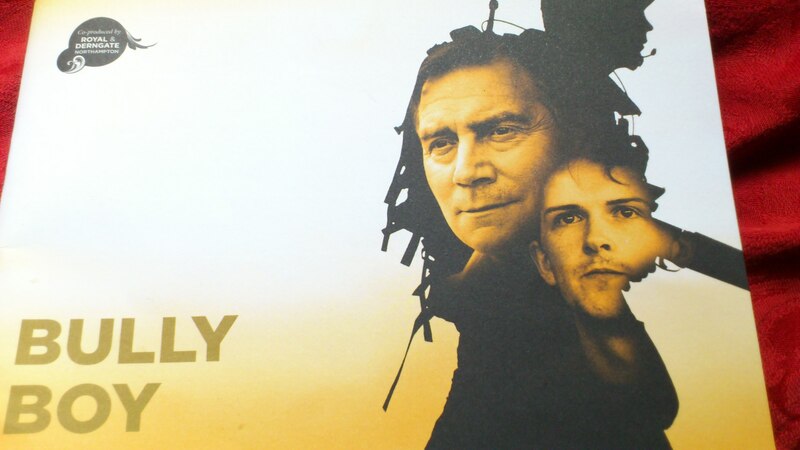 Major Oscar Hadley (Anthony Andrews), a Falklands veteran, is sent by the Army to Afghanistan’s combat-zone to investigate the death of an eight-year-old civilian boy and his mother at the hands of a group of British soldiers, nicknamed ‘the Bully Boys’. 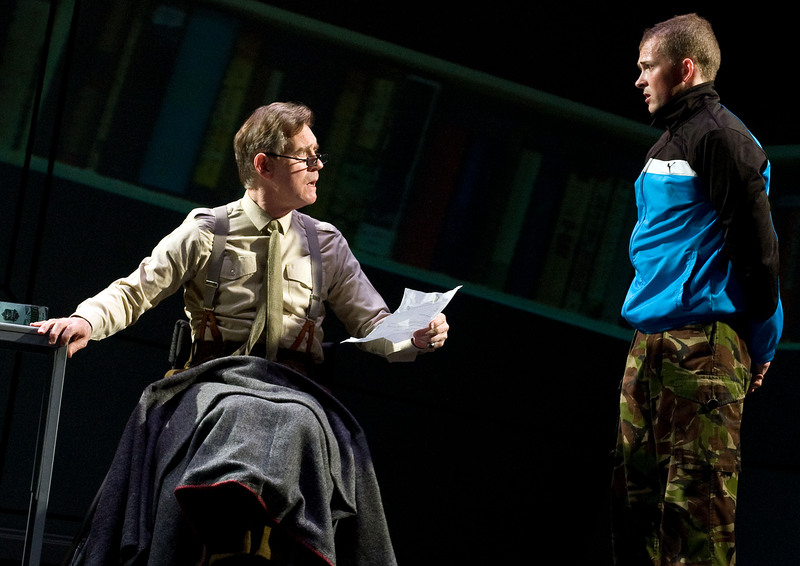 He interviews the prime suspect; pumped-up, aggressive young soldier Eddie Clark (Joshua Miles), a 20-year-old from Burnley who signed up at 16. Eddie is immature and institutionalised, showing racist indifference to the dead locals he has been sent to protect, and fiercely defensive of his fellow ‘bully boys’ who the Major implies have blamed him for the death. 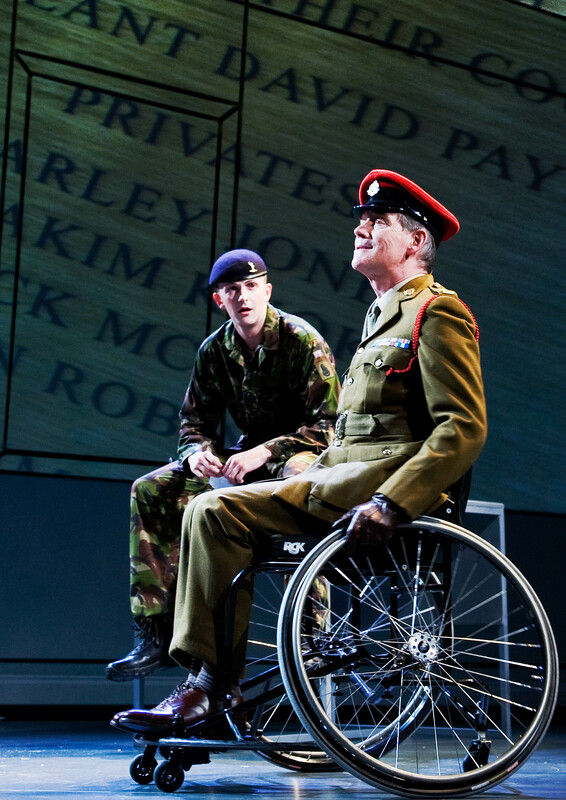 Using a stripped down set (R&D on top form as always) with lighting and sound effects that literally make you jump out of your seat, the developing relationship between the two soldiers is mesmerising and incredibly moving. Andrews, perhaps typecast through his career as the tortured toff, is on top form in what must be both a physically and mentally exhausting production, especially for a national treasure now in his 60s. But the play is notable for the extraordinary performance of newly graduated Joshua Miles as Eddie, rolling the character through such a series of demands both emotional and physical. He is pure squaddie from head to foot and his development of the character from hateful ignorance through to tragic victim shows great talent for a young actor. Written by comedienne and broadcasting darling Sandi Toksvig, better known for her appearances on Radio 4 and QI, Bully Boy is both deeply moving and humourous. Despite detailed research with military charities and her own partner, a psychotherapist, the story, for me, was not without faults. Several times I found myself jolted out of suspension of disbelief – “well, he’d never have spoken to him like that,” or “the Army would never have let them travel in the same vehicle”,”that’s a sports wheelchair”, and on several occasions, “where are the bloody Military Police in all this?” The initial question of the death of a child and his mother gets forgotten as sympathies switch to the mental health of the soldiers. Nevertheless it’s an extraordinary telling of the truth about war and its consequences, and a stark expression of the issue of the ongoing mental health of generations of forces personnel. An excellent piece of theatre again from Royal & Derngate, Bully Boy is a completely re-staged version from the first run of the play in Southampton last year, and will continue on after its Northampton run into undoubted success in London. I highly recommend you see it while it’s here, and it’s a shame it can’t be made compulsory viewing for all secondary school children. Or just everyone. Bully Boy runs until Saturday, September 15. Tickets can be booked now by calling Box Office on 01604 624811 or visiting www.royalandderngate.co.uk. Make sure too that you put some pennies in the collection bucket for the Combat Stress charity, or text BBOY12 £5to 70070 to give an instant donation of a fiver to help veterans with wounded minds. IT was an A Level text I’d managed to dodge as a teen. 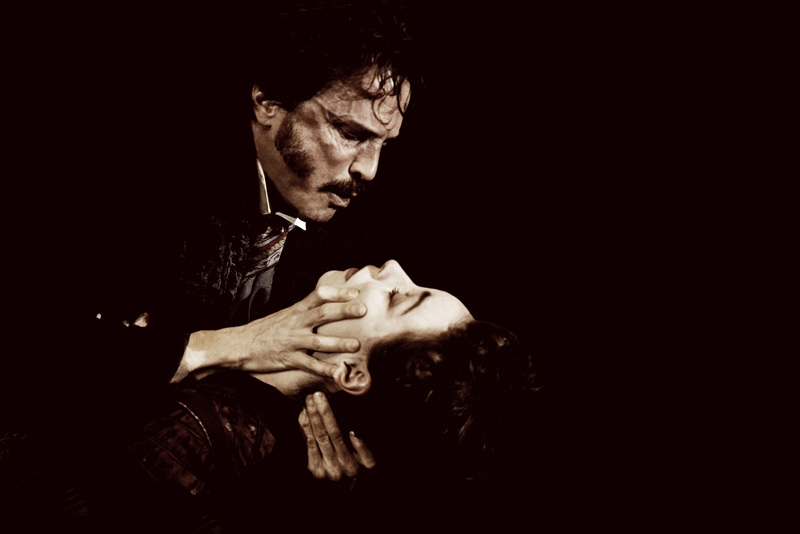 But plenty of English and Drama students will have read and seen Ibsen’s depressing masterpiece Hedda Gabler. Running at Northampton’s Royal & Derngate as the final installment in artistic director Laurie Samsom’s Festival of Chaos trilogy, this is a stark departure from the larger-than-life offerings of The Bacchae and Blood Wedding. A new, stripped-down cast of seven take to the beautifully lit, impressive but stark stage which stays static in the stifling drawing-room of the newly-wed Hedda, nee Gabler, now Mrs Tesman, in 1890s Oslo. We’re introduced to her puppyish dolt of a husband, Jorgen (Jack Hawkins) and the obligitory overbearing aunt (Sue Wallace) while tutting servant Berte (Janice McKenzie), makes her mark with a scattering of lines. The sets are muted and the dialogue conventional until the malevolently bored Hedda (an astonishing performance by Emma Hamilton) appears, displaying the nonchalant rudeness of the spoiled little rich girl. Utterly frustrated by the life she’s chosen and the status of women, and jealous as hell of the relationship between her alcoholic-tortured-artist-ex Lovborg (the marvellousoly monikered Lex Shrapnel) and a timid school-friend Thea (played with utter conviction by Matti Hougton), she sarcastically bullies and belittles all around her instead of seeking the freedom she incites in others. A superb cast, pale and Nordic to contrast with Hedda’s flame-haired femme fatale, create tightly-would tension throughout the two and half hours, with little relief for an audience helplessly fixated on the impending doom. 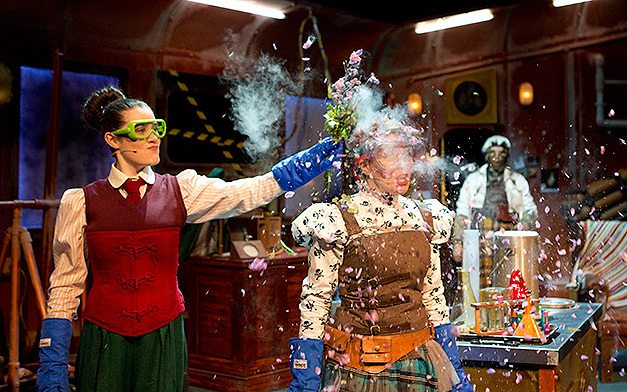 It might not sound like a fun night out, but it is brilliant, provocative and engrossing theatre. And yes, I did jump in my seat. Again. 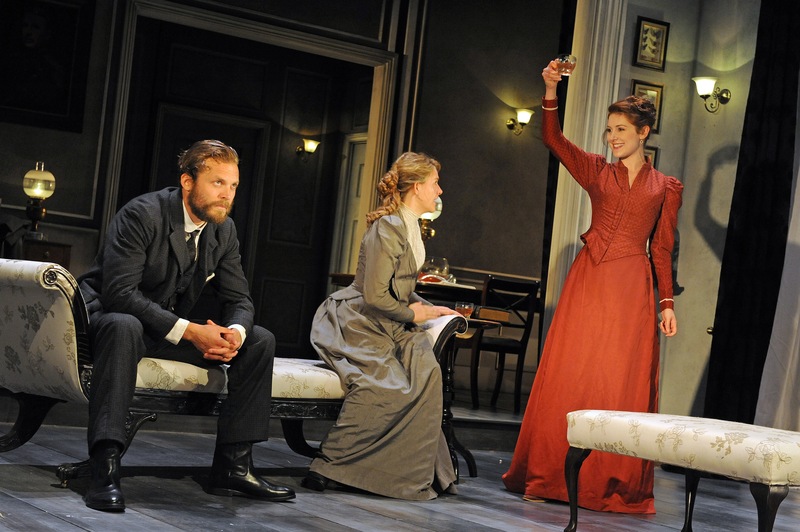 Hedda Gabler runs at Royal & Derngate, Northampton, until July 28.